Following their 4-0 thumping of Albania in Shkoder, Scotland have gone level on points with Israel at the top of Nations League Group C1. The win has also eased the pressure on head coach Alex McLeish whose job, after last month’s defeat in Israel, was under threat. 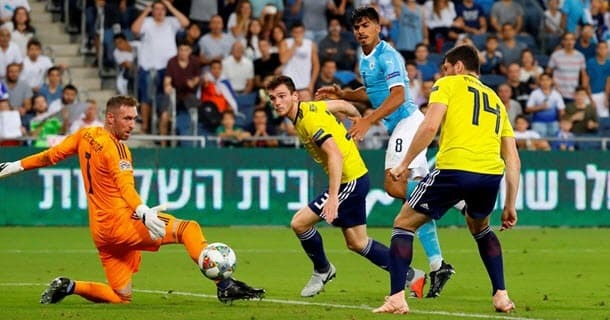 It means that a win against Israel on Tuesday night will secure top spot in the group for the Scots, and also offer them a chance of a play-off spot in Euro 20 qualifying if they fail to make it through qualification at the first attempt. An early goal from Ryan Fraser in Shkoder had already given the Scots a flying start when Albanian captain Mergim Mavraj was shown red for head-butting Ryan Christie. From there Scotland took complete control of the game. A penalty from Steven Fletcher and two second-half goals from James Forrest gave the Scots a comfortable and deserved win. It’s been a tough campaign for the Scots though and this final round of games has been no different with McLeish having to contend with nine call-offs. But his decision to opt for a young, energetic side, as opposed to recalling some experienced names, paid off handsomely. As well as looking to gain top spot in the group, Scotland will also be looking for revenge for a disheartening performance in Haifa when they were beaten 2-1. But the Scots (and McLeish) have rallied well and a winner-takes-all Hampden Park showdown awaits, with an expectant national stadium guaranteed to be rocking in the hope of cheering their team to victory and promotion. With Group A3 already decided there is nothing but pride to play for in Guimarães as top and bottom go head-to-head. Portugal – who host the finals of this competition next summer – have qualified with the minimum of fuss and with a game to spare, despatching Italy in the process, and all without the services of one Cristiano Ronaldo. They have put to bed once and for all the myth that they are a one-man team. Fernando Santos’ side have fared well without the Juventus superstar and are now unbeaten in five games since the World Cup, their 0-0 draw in Milan on Saturday night arguably the pick of the bunch given the circumstances. For their part, the Poles have been unable to shake off the disappointment of a poor World Cup and despite replacing manager Adam Nawalka with Jerzy Brzeczek, they have failed to win post-Russia – losing three and drawing two of their five games since. So, in 2020/21 they will line up in the competition’s B division. Please let us know what you think of our tips. Click the button below and share on Facebook or Twitter and tell us if you agree or disagree with our selections! The post Scotland to Sign Off Their Nations League Campaign in Style appeared first on .